It's a Scrappy World: New Challenge up at Pile it On and Crafty Hos! There are some great new challenges up today at Crafty Hos and Pile it On! As my own personal New Years Challenge, I decided to see just how many of my Design Teams I could represent in one card! I was surprised to find that I could fit in almost ALL of them! Pile It On's wonderful new challenge this week is sponsored by Technique Junkie! The theme is 'Brand New'! Well, not only does my card celebrate a brand new life, it also features brand new ribbon, and DP! Which is just perfect - because the Crafty Hos Challenge has a new challenge up today with a New Baby/Baby Card Theme! Don't forget, Bugaboo Stamps Catch the Bug Challenge and the Aud Sentiments Challenge are both Anything Goes themes this week too! AIFactory as always, has gotten in the game for my card with their gorgeous 'Elegance' theme! Looks like they made it REALLY easy to do my personal challenge doncha think? When all is said and done and you are ready to celebrate the New Year with Auld Lang Syne, Be sure to make one last quick stop at the Shelly's Images Blog to leave some goodwill and enter to win their challenge too! What a FUN-tastic way to start the New Year hmm? Wow Scrappy! This is so beautiful card. Thanks for playing at OSAAT. Scrappy this is absolutely precious - Hugs! I have added you to Mr Linky over at Let's Craft and Create. Thank you for joining in with our latest challenge. Adorable. Happy New Year. Thank you for joining us at Digi Doodle Shop's Best. Really sweet card Scrappy. Thanks for joining us at OSAAT. A wonderful and very cute card! Thank you for playing along with us this week at Digi Doodle Shop's Best! Wow, so many challenges ! Fabulous card, just love the image you used. Super super sweet. Thank you for playing with The Pixie Cottage this week. Happy New Year. So precious! Thanks for playing with Speedy's Friends! This card is precious! Beautifully put together! Thank you for joining us at Freshly Brewed Challenges! Thanks for joining our Embelish It Challenge at Top Tip Tuesday, your card is fabulous. What lovely card you created! Really adorable, so so cute and delight! Thanks for joining us at DDCC this week. 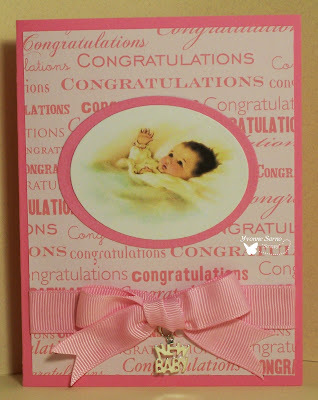 Beautiful baby card! Thanks so much for joining our Really Reasonable Ribbon challenge. Awesome! !Thanks so much for playing with us at Etsy Inspired Challenge! Just as precious as can be. A new baby is certainly something to celebrate. So glad you joined the Stampin B's 'celebrate' challenge this week. A really pretty celebration card. Love the image and the charm too. Thanks for joining us at the Pixie Cottage. Very sweet! Thanks for playing in the Etsy Inspired Challenge! Your card is just so so sweet!!! I love the soft pinks and that darling charm!!! Thanks for celebrating with us at Freshly Brewed Challenges. Love the pinks! Glad you could join us at The Pixie Cottage! Such a lovely card! I really like the pretty baby image! Fabulous!! Thanks for playing EIC with us this week! Lovely card! Thanks for playing along with us at EIC this week! Gorgeous card with such a cute image! Happy New Year to you and thanks for taking part in our first challenge of 2011! Hope to see you again next month! Great card! Thanks for playing with EIC this week!! Awe! this is so adorable, love the image and that beautiful bow and charm. Thank you for joining us at Fairy Fun Friday this week with your lovely creation. Great way to welcome a new baby! Thanks for joining us at FFF, we look forward to seeing future creations. Aw this is so sweet scrappy! She is so darling!! Thanks again for joining us at SV! What a totally PRECIOUS card! I love everything about it. THanks for sharing it at OSC last week.